First and foremost, what exactly IS a mezzanine? How does it work? What is the purpose? You are asking all of the right questions, and there is a good chance that you have seen one before. For those who do not know, a mezzanine is actually a great way of adding space to a room, or even a factory floor, without going to extreme measures. This concept is used by industrial factories, fancy hotels, and even skyscrapers. Let’s take a hotel, as an example. When you enter the front lobby, you may see a large balcony stretching across the front of the lobby in question. This is a mezzanine. It is a floor, but it does not count as a level in the building. In fact, even if you were to walk onto it, you would still be counted as being on the first floor of the building. In a hotel situation, this allows for more space, and overall, a more interesting décor. 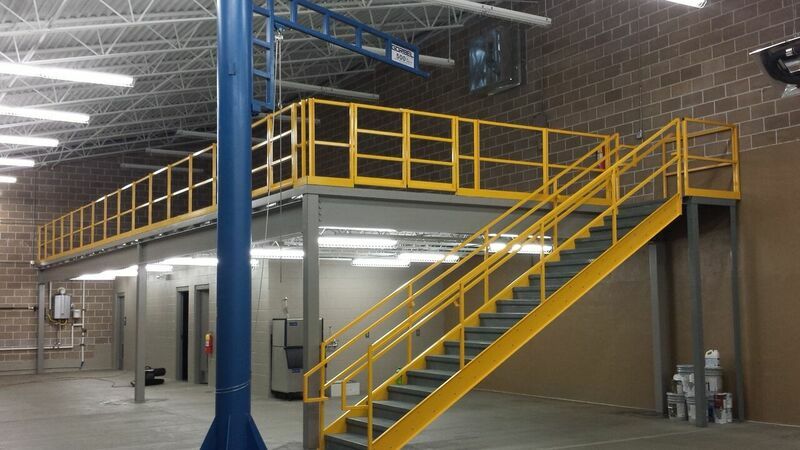 Now, in an industrial setting, a mezzanine is much more practical, and you may actually find them in a number of different places throughout the factory or plant floor. So, what do mezzanines by Panel Built have to offer the average business exactly? More than you think! You can apply the mezzanine to a number of different purposes. For example, if you need an overlook station for an assembly line, you would install a mezzanine. In a case like this, the mezzanine would be used directly in combination with a modular building, You can easily place a modular building atop a steel mezzanine, or if you are more interested in a custom job, you can build the mezzanine around the modular building. Either way, the job gets done, and you have your overlook station. In the same vein as an overlook station, you can elevate a modular building using a mezzanine in order to view the entirety of your factory floor. The modular will be off the floor, and out of the way of any employees that need to get through. This is a perfect way to keep an eye on things without actually being in the way, which is infinitely helpful, as you know. There are several other uses for the mezzanine, of course, and uses that you may not have considered. For example you can use a mezzanine as part of an assembly line so that you may keep the majority of available stock on the elevated platform while storing excess below. This is actually one of the more common uses for such constructs within a building, and something that you should most definitely keep in mind. We are a company that sells prefabricated steel mezzanines and as such, we are well versed in their installation. When you are ready to have yours installed, you can either rely on your own expertise and employees, or you can have us perform the installation within a matter of hours. Our installations will ensure that it is put together properly, and that it will stand the test of time. If you opt to put it together yourself however, that can most certainly be done, and we will eve provide you with the specifications so that you do not make any mistakes during your endeavor. Getting the product is easy, all you need to do is head over to our website and click ‘find a rep’. From here you will be presented with a map of the United States, and you will have the option to click your home state. Once you have done that, you can find a representative stationed near you who will go over your wants and needs. From here you can decide whether you want to use a pre-manufactured mezzanine, or if you need to take it a step further by ordering a custom job. The choices are nearly endless when it comes to your structure and you will quickly see that learning where to find custom mezzanines online was one of the greatest things you could have done. If you are ready to equip your business with one of our stainless steel mezzanines, then now would be a great time to visit our website , find a representative, and most importantly, find a product that you like. There are many different ways to install a mezzanine, as you quickly find out, and before you know it, you will find out just how effective they can actually be. Whether you need to build a base of operations within your building, or create a storage area, you will have precisely what you need, and you can be rest assured that it will stand the test of time. We have the best modular mezzanines available for sale and we are ready to deliver them right to your front door. As one of the premier metal building providers, we’re ready to bring you high end structures complete with a warranty, and of course, our guarantee that they will get the job done. Check out our website as soon as possible and begin the short process of getting the structure you need from our factory floor right into your own warehouse. It’s time to escalate the situation.